Toto Volpe, the latest member of the Mosquito Fleet family, was born in Napoli, Italy, in 1961. 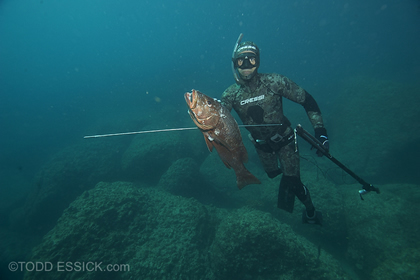 Since the early age of 12, when he built himself his first hand made spearfishing gun, he dedicated all his life to the sport of freediving & spearfishing as his biggest passion and which in the last 25 years has become his profession. At eighteen (as soon as it was legally possible) he enjoyed the spearfishing competition scene in Italy and internationally, travelling everywhere in the world and later taking part or managing various operations, spearfishing camps, trips and liveaboard expeditions in such different places as: Italy, Spain, Greece, Croatia, Canary Islands, Azores, Florida, California, Senegal, Tanzania, Comoro Islands, Tahiti, Mexico, Brazil, South Africa…the list could go on and on. He has collaborated with numerous specialized magazines and publications; his ties with the industry are very consolidated due his involvement in the research and development teams of world known manufacturers through the years. From oil rigs diving to blue water hunting, bottom fishing, deep reefs action, Toto has covered successfully every possible aspect of this exhilarating sport, always faithful to his responsible catching philosophy based on the laws of sustainable harvesting; minimum weight per species and limited catches bags are a must in this activity that has to be considered as the truly most selective way to fishing for sport and food. 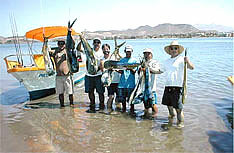 Toto is now residing in La Paz where he has been spearfishing for the last year catching some of the biggest trophy fish seen in the area, giant Cubera snappers, big Cabrilla groupers, great amberjacks and so on… He especially likes the balance that this part of the Sea of Cortez offers between the challenging conditions and the solid productivity of the hunting grounds; his knowledge of the fishing sites, the capacity of adapting different tactics depending on the season and his proven guiding and instructional skills will be an invaluable asset for the spearfishermen, novice to expert, that decide to partner with the Mosquito Club for his or her adventure here in La Paz. Toto will be happy to personally answer any kind of questions or requests relative to spearfishing in La Paz and to get to know you personally as soon as possible at our facilities.